The word comes from a Latin word, tyrius. It means "cloth" in English. Tartan is a fabric which is woven with an assortment of stripes in varying widths and colors set at right angles to each other. 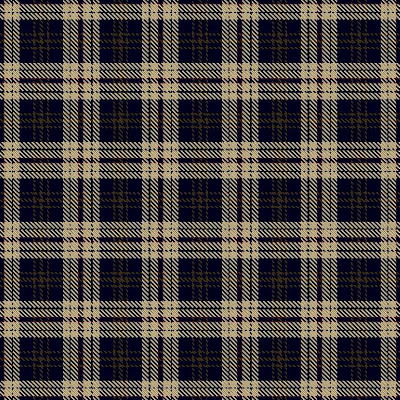 The distinctive checked pattern of tartan is closely associated with Scotland and Ireland, both of which have been weaving tartan for centuries. As tartans are relatively easy to weave and also quite striking, most cultures do demonstrate a history of weaving textiles with checked patterns, too. The first use of the Burberry design was said to have been by an Italian luggage manufacturer (John Bain reported that this came from David Doig, a well-known and very knowledgeable man from Scotch House in London). 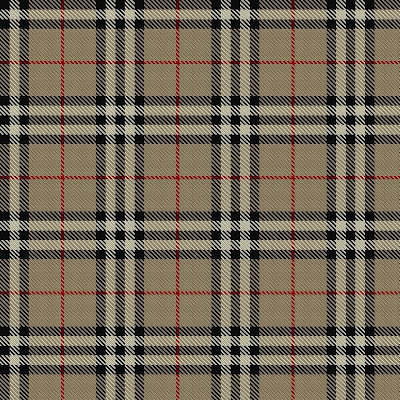 It has become so much part of the Burberry image that it has been trademarked and can now be regarded as a Corporate tartan. John Emary was a tailor in Mayfair London in 1853, who perfected the manufacture of water proof woollen material. In the same year, he changed the name of his business to Aquascutum (in Latin Aqua = water, Scutum = shield). HM King Edward VII was Aquascutum's first royal client, ordering an Aquascutum coat in the Prince of Wales check. In 1897 (some time after Gieves and Hawkes), Aquascutum was granted its first Royal Warrant (a mark of recognition to companies who have regularly supplied goods or services for at least five years to members of the Royal Family).